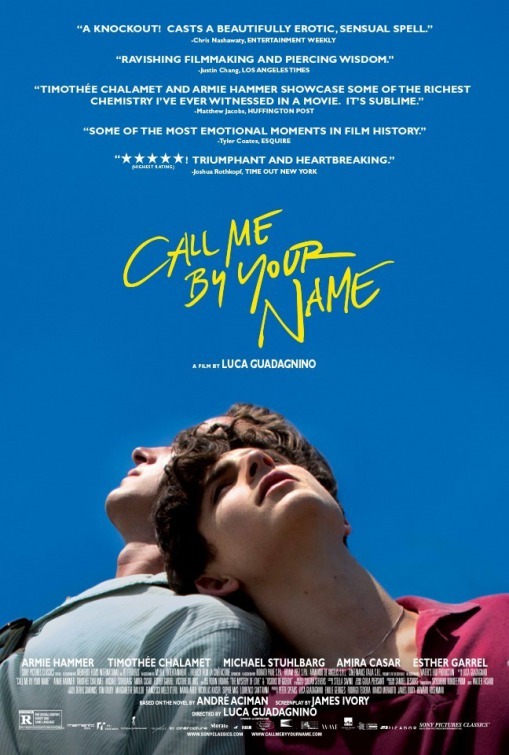 Synopsis: In Northern Italy in 1983, seventeen year-old Elio begins a relationship with visiting Oliver, his father’s research assistant, with whom he bonds over his emerging sexuality, their Jewish heritage, and the beguiling Italian landscape. Review: At first glance, it may appear that Call Me by Your Name is a throwback to a simpler and more carefree time. Sure, the Italian countryside on display in this romantic drama is filmed postcard ready and the means by which the sun waxes and wanes to cast great light on everyone it touches may have you ready to dial your travel agent the moment the credits roll. People lounge around pools next to their villas, ride bikes into town to grab a drink, and meals are served al fresco with ingredients sourced from local farms. It’s a beautiful life, to be sure, but there’s an unseen struggle that’s captured here and it makes for one of the most tantalizing movies of 2017. It’s the summer of 1983 and the Perlman’s have opened up their home to a new graduate student, Oliver (Armie Hammer, Mirror, Mirror). Arriving to assist Mr. Perlman, an archaeology professor, Oliver’s Greek god physique and allure has a way of opening more than just doors for him. That doesn’t seem to matter much to Elio (Timothée Chalamet, Lady Bird) the Perlman’s 17 year old son that has to yield his bedroom to Oliver for the next six weeks and isn’t an initial fan of the older man. (Random thought: Interesting that Elio’s new room seems just as spacious as his previous one…why couldn’t Oliver just take that one? Well…anyway). This is a family of book-smart, talented individuals that have a funny way of not talking about what they’re really feeling. It’s not a stifling home, though, and Elio’s parents seem understanding and thoughtful. Feigning disinterest in Oliver but secretly harboring a growing curiosity he can’t explain away, Elio goes about his summer dating a local girl, finding ways to point out how Oliver is perhaps not the perfect specimen people seem to think he is, and giving command performances that show off his innate musical abilities. Instead of recognizing that he is attracted to Oliver, Elio does what we’ve all done when we like someone but are too afraid to let them know, he acts like a jerk. Adapted from André Aciman’s novel by Oscar nominee James Ivory, the movie takes its sweet time to get to Oliver and Elio’s eventual union. It makes for a bit of a tease for the viewer and Chalamet and Hammer have such unique chemistry that by the time Elio steals a furtive kiss on a mid-day excursion you almost feel like standing up and applauding his bold move. The range of emotions captured after that first toe dip in gay waters is handled so delicately by director Luca Guadagino (A Bigger Splash) and his actors. They don’t just hop into the sack together, but both take time to think about what this coupling means for themselves and each other. As the summer days dwindle and the fall approaches, Elio and Oliver’s romance has its ups and downs as both push back against their needs as a way to safeguard their heart. For the more experienced Oliver, he sees a responsibility to his younger lover to treat him with respect for his new feelings while Elio just wants to drink in as much time with Oliver as he can before he returns to the states. As the departure day arrives, our stomachs start to twist into knots at the anticipated goodbye that’s sure to wreck us almost as much as it does Elio. Gay or straight or other, there’s a little bit of something for everyone in Call Me by Your Name. It’s honest approach to first love and the devastation of it slipping away is summarized perfectly in a final speech from Elio’s dad (Michael Stuhlbarg, The Shape of Water). Delivered with a painful honesty that shows his ultimate respect and compassion for his son, it is maybe the most transcendent scene I saw in theaters this year. Everything seemed to fall away (the theater, the audience members, the rest of the screen) and all I saw was his face and heard his voice. A suberb moment in a magnificent film. Synopsis: Summer of 1983, Northern Italy. An American-Italian is enamored by an American student who comes to study and live with his family. Together they share an unforgettable summer full of music, food, and romance that will forever change them. Thoughts: With a screenplay from James Ivory (The Remains of the Day, Howard’s End, A Room with a View) and directed by Luca Guadagnino (I Am Love), Call Me by Your Name is a title that could be one to keep your eye on as we transition from the summer slate to the Oscar hopeful season. Based on the 2007 novel by André Aciman and taking place over one gauzy summer in Italy, there are some strong themes of love and self-discovery clearly present in this first trailer. It’s always interesting to see how a tender story like this will play out for audiences in the wide-release arena, but then again movies like Call My by Your Name aren’t exactly made for mass consumption. Starring Armie Hammer (The Lone Ranger), Michael Stuhlbarg (Doctor Strange), and Timothée Chalamet (Love the Coopers), call me very intrigued with this one.